Many corporations may opt to provide quick chair massages to their employees in the workplace, during events, and at retreats. Research shows chair massages can improve focus, productivity, and morale. Staff members can relax with these mini massages in the middle of busy days and then go back to work with clearer, calmer minds and reduced stress. Though chair massage sessions may last only 10-20 minutes, there may be great value in these mini massage breaks. Massage isn’t just a perk or a luxury. With less pain, stress, and distraction from hunching over a desk for hours at a time, staff members might benefit from a massage break by experiencing a morale boost and working more efficiently than usual. Researchers found a substantial increase in focus in nurses who received 10-minute massages during their work hours. They considered biweekly sessions for a period of four weeks to be the most effective intervention. However, even occasional chair massage offerings at events or in the workplace can help employees feel valued, encourage better health, and facilitate stress reduction. Experts say workplace massage has become much more prevalent in the last decade. Companies such as Google, Boeing, and Eddie Bauer include massage in their workplace fitness and wellness programs. Some tax accountancy firms and retail chains find massage to be a great way to boost morale in employees who put in long hours during seasonal rushes. If companies can’t do anything to decrease employee workloads at high-volume times of the year, they may turn to massage to reduce workplace tension. Not only do these offerings increase productivity, but they may also help businesses attract new employees and decrease turnover rates. Some companies have even found that massage reduces workplace injuries, compensation claims, and requests for time off. Research has found that employees who lack social support in the workplace often manifest this stress as depression. Many employers don’t recognize workplace depression or know how to deal with it. Workplace depression can lead to increased absenteeism, high turnover, and early retirement, but some managers have learned to combat it by treating stress with healthy alternatives like chair massage. Because massage does not fall into the general category of work benefits—which often include insurance, bonuses, or vacation time—and most employees may not expect to receive a massage at work, a workplace massage might feel like a gift from an employer. Massage at work can feel like an added luxury, creating genuine gratitude in employees. During your chair massage, you will sit in a special chair that supports your entire body. You can remain fully clothed as your massage therapist works on your shoulders, neck, arms, back, and hands. A chair massage session will likely last 10-20 minutes. Chair massage therapists typically charge clients in small time increments (often 10 minutes) and may also require a setup/tear-down fee. When visiting your workplace, a practitioner may require you to order a minimum number of massages. If you have a large staff, it may be best to ask your therapist to bring along a colleague. Before your session begins, talk briefly with your therapist about your needs. For example, you might ask the therapist to focus on any knots or cramps you feel in your back or neck. If you aren’t sure where to start, remember that working long hours can cause shoulder and upper back tension. When you crane your neck to hunch over your desk and computer monitor, these muscles have to work harder and could use some therapeutic attention. Many people who work on computers may be more prone to carpal tunnel syndrome. 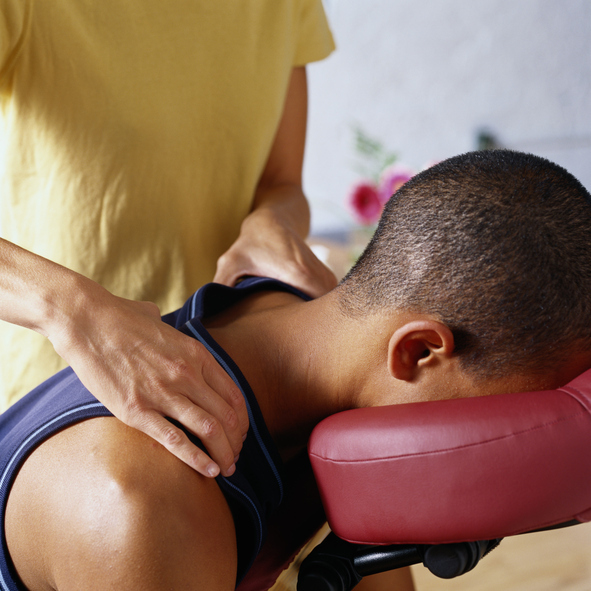 You may want to ask your massage therapist to pay special attention to your shoulders, arms, hands, and fingers. Your practitioner can work on the muscles and soft tissue surrounding the nerves that travel from your neck to your fingertips. By releasing adhesions in these tissues, your therapist may be able to help you achieve better posture and reduce pain or numbness. Workers often report a reduction in symptoms such as back pain, limited range of motion, and numbness over the span of several chair massage sessions.